Phishing (pronounced "fishing") is how cybercriminals trick people into providing them with personal, financial or other sensitive information such as credit card numbers, account username or password, date of birth or social security number. Cybercriminals typically use email or pop-ups as bait, disguising themselves as a well-known company, to win your confidence. The messages look genuine and invite potential victims to click on a hyperlink, which will take them to a fraudulent website that tricks them into disclosing personal data or information. Once cybercriminals have a victim's personal information they can use the information for many types of fraud, such as to steal money from your account, open new accounts in your name or to obtain official documents using your identity. As a policy, Suddenlink will never contact you via e-mail, pop-up or phone requesting personal information or passwords. Generic greetings with no personalization. Spelling errors or bad grammar. An offer too good to be true. Request for private or sensitive information. If you believe you have received a phishing email or pop-up, do not click any links or download any attachments. You can simply delete it and do not respond or you can report it to us so we can add it to other reports from customers as we try to keep such scams from reaching you. 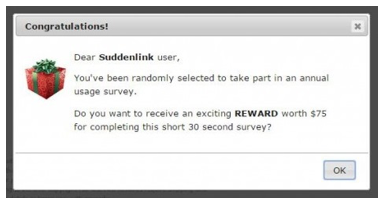 To report a phishing messages, please forward the email in its entirety to submit-phishing@suddenlink.net. If using Suddenlink Webmail, you can also report it when you select the suspicious message and click Phishing. Immediately change your passwords for any potentially compromised accounts. Contact your bank or financial institution and credit card companies to let them know your accounts may be compromised. Place a fraud alert with any one of the three major credit bureaus as soon as possible. Keep an eye on your email and financial statements regularly to identify any false charges or suspicious activity. Scan your computer using antivirus software. Sometimes when you click on a link in a phishing email, a virus or spyware may download onto your computer without your knowledge. Always be suspicious of unsolicited emails or messages particular those with offers that seem too good to be true or contain phrases like "Verify your account", or "Update your account", or "During regular maintenance", or "Failure to update your records will result in account suspension". Never reply to emails or pop-ups asking for personal or financial information. Reputable businesses never ask for personal information via email or pop-ups. Be cautious about opening attachments or clicking on links in emails. Even your friends or family members' accounts could be hacked. Don't call phone numbers or visit websites listed in emails sent from an unknown source. Type addresses directly into your browser or use your personal bookmarks. Avoid sending sensitive information, such as credit card numbers, dates of birth or social security numbers via email. When making purchases or submitting sensitive information online, make the web address begins with https:// rather than http:// and the on-screen padlock icon is displayed in the address bar. If you're unsure whether an email request is legitimate, it is always best to contact the company directly to inquire about it using previous statements for contact information.